The Salzkammergut is our itinerary. Initially, I had planned a self-drive in the Salzkammergut. But owing to India’s archaic IDP regulations, that plan had to be shelved. My next best option was to stay either at St Gilgen or St Wolfgang or Bad Ischl. Bad Ischl easily tops the connectivity charts in the Salzkammergut. It enjoys rail and road connectivity to most of the attractions in the lake district. However, it reminds me of Salzburg due to it’s traffic and while it’s streets don’t really bustle all that much, the villages of St Gilgen and St Wolfgang offer a more peaceful, charming getaway to the lake district. Moreover, who in their right mind, would not want to stay close to the banks of one of the famous lakes in the region ? We realize later on, that the touristy buses making their way for Salzburg or Hallstatt are missing out on a real gem, by driving past St Gilgen. We caught a train from Vienna to Salzburg. From right outside the Salzburg Hauptbahnhof (railway station), we caught Bus No. 150 from terminal F, that for 19 euros each, dropped us in around 50 minutes to a stop named St Gilgen Hollweger, although everybody we met, including the bus driver referred to the stop as the Spar supermarket stop. There are numerous sight-seeing options around St Gilgen. Tickets for these destinations can be bought on the bus itself. Their services run on all days, with only a limited routes running on Sundays. If you plan to use public transportation to visit places in and around St Gilgen, then buses could be your choice, albeit a bit expensive. Latest fares and timings can always be checked on their useful official app here. Note: I couldn’t find any self-drive options in St Gilgen. The nearest self-drive outlets seemed to be in Salzburg. 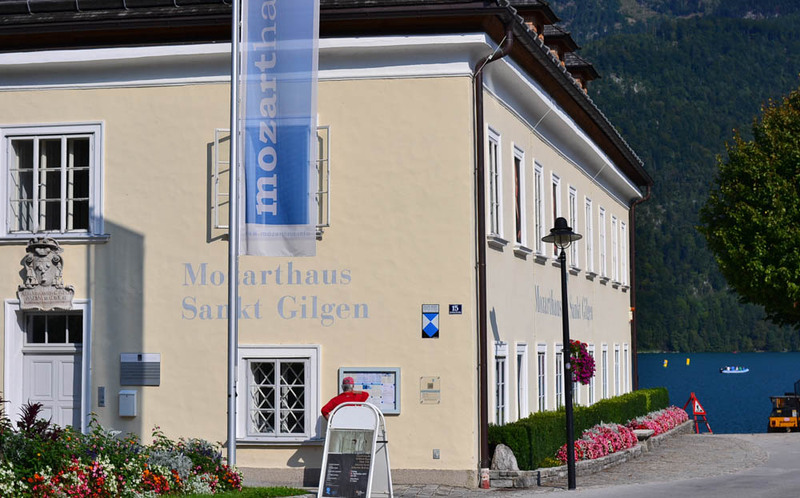 St Gilgen’s claim to fame is that Mozart’s mother was born here. Her father’s erstwhile residence has now been converted into a museum, a stone’s throw away from the lake and is open to the public on select days of the week. St Gilgen also has a war memorial dedicated to the memory of the soldiers who perished here during the second world war. Interesting anecdote from a war hero, if you wish to read about it here. It is evening when we first set out to explore St Gilgen. In halting English, the kind gentleman at the counter that sells tickets to the Schafbergbahn, explains to us that the last ferry to Wolfgangsee has already left. It would be better for us to come back the next morning, he assures us and we move on. There is a light breeze and the mild, cheerful banter of the crowds gathered to enjoy the evening on the banks of the lake. We take a leisurely stroll here and enjoy the sights and smell the fresh air, just what the doctor ordered. Enjoying a lovely evening on the banks of the Wolfgangsee, with a scoop of Gelato in one hand and friends and family on the other. We caught a few folks swimming in the clear waters of the lake, some sunning themselves, some playing fetch with their dog in the shallow bed near the lake. 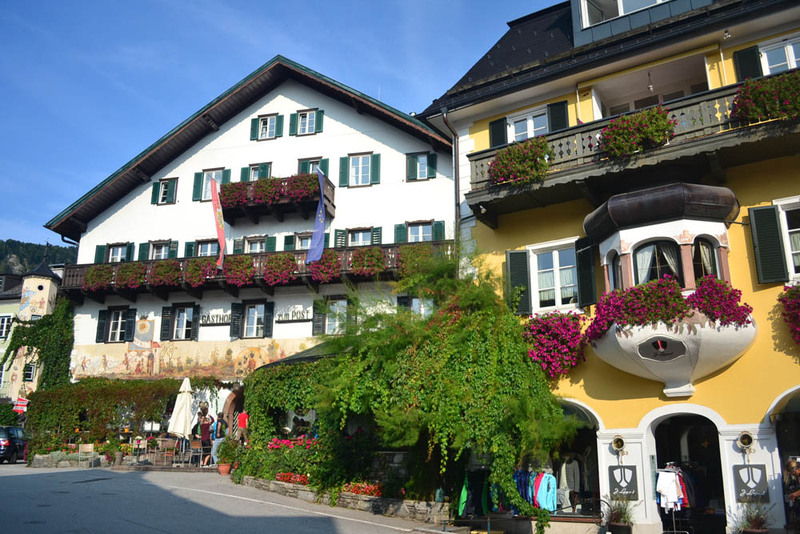 The pretty Alpine style houses and Pensiones (a kind of bed & breakfast) of St Gilgen add a lot of color to the village. Some of the bakeries and restaurants host a delightful menu of fresh Apfelstrudel accompanied by great coffee. One of them, Cafe Dallman is our recommendation in St Gilgen – their Apfelstrudel with icing sugar and vanilla was heavenly when it grew a little cold in the evening. 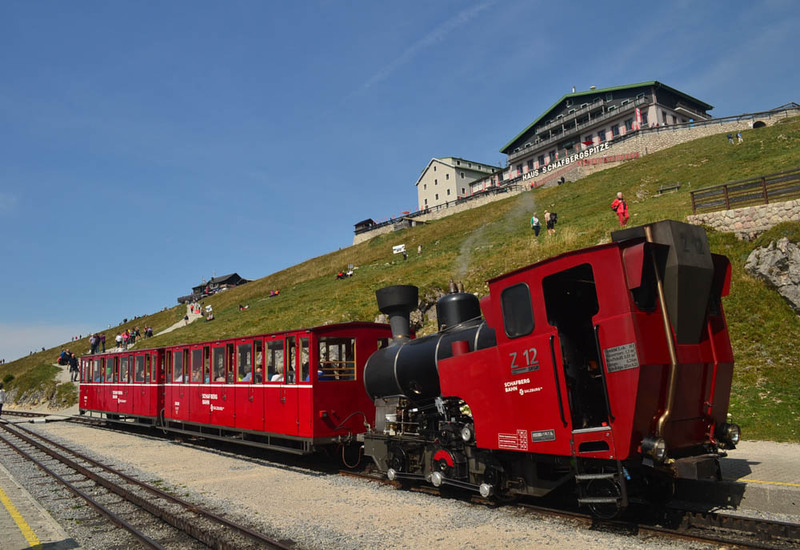 Hallstatt & it’s salt mines, the ice-caves, the Dachstein five-fingers and toboggan rides in Strobl are also another option. 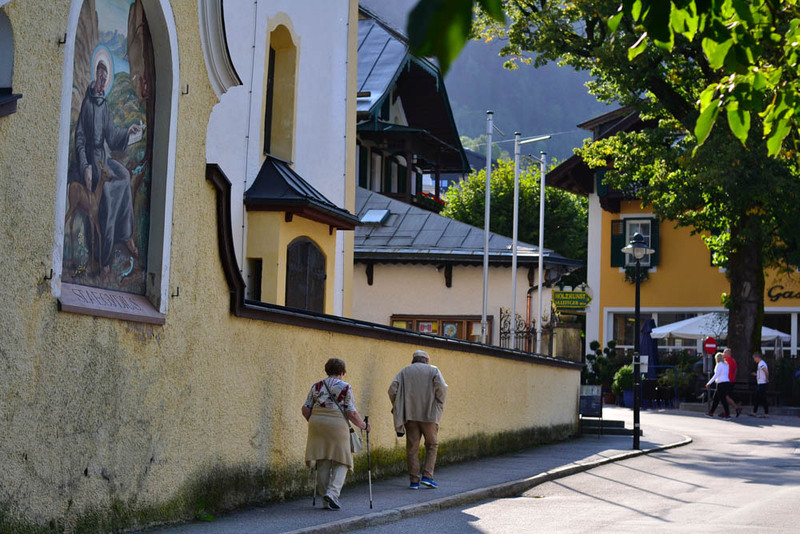 Out of these, Hallstatt is a must, must-do – there simply is no village like it. Stay: We stayed in a fully equipped apartment – Alplet Apartment on Teichstrasse which is a 5-10 min walk up an incline from the village of St Gilgen. The apartment could comfortably accommodate 4-6 people and had generous parking space outside. The trade-off, of not living in the center of the village itself, was that we had a fully stocked supermarket in the vicinity, which ended up saving us a fair bit of money that would otherwise have been spent on restaurants and cafes. Also, there is a tourist center on the way for pointers on sightseeing in the vicinity. The tourist center, the supermarket and the St Gilgen Hollweger bus stop are all co-located within a few meters from each other. 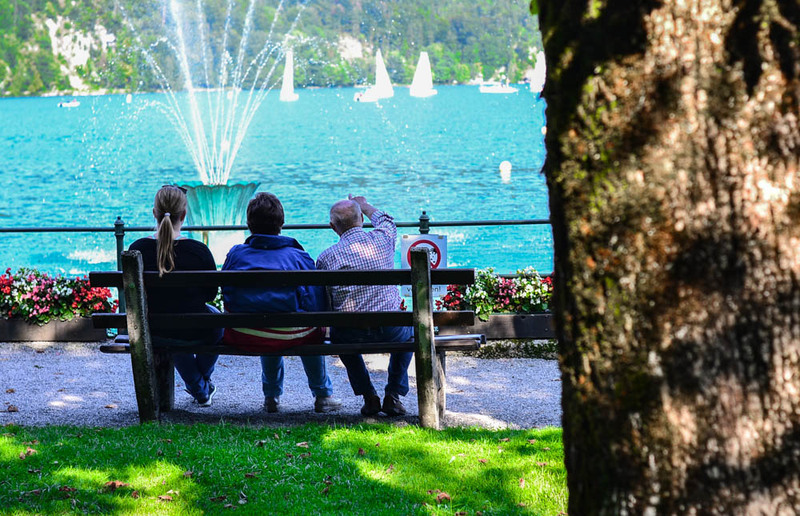 On a budget, my other choices were the equally splendid bed-n-breakfasts Pension Falkensteiner and the Haus Mayerhofer, which we did pass by every day while walking to the lake. If we were to choose a self-drive option, I would have opted for the charming Haus Seehof on the edge of the Wolfgangsee Lake. In retrospect, we think that staying in the village itself would not have been a bad idea either. Watching pretty villages decked up in the colors of the night, is one of the better ways to spend some time in the Salzkammergut.